Installing your theme is pretty easy! 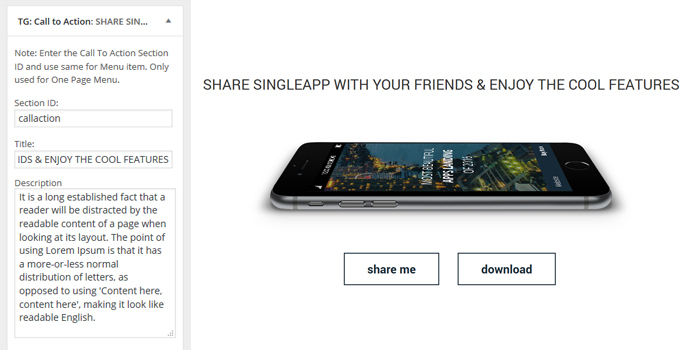 After downloading you should have a singleapp.zip file. This is a compressed file containing all of the required templates and images required for the theme to function properly. Primary Menu will not display if you make page as front page. Front Page MenuDisplay the menu only in front page on the Left side on the Header. Front Page Menu only display in front page of theme. For inner page you have create new menu and set it as Primary Menu. Header Image Call To Action, by default, is disabled and will only display on Front Page. All the options related to Header Image Call To Action part are available in Appearance-> Customize-> Header Image Call To Action. Upload Image for Current header to set the backgroud image for Header Image Call To Action. Enter title, text, Thumb image, button text, button url, button font icon to dispaly. The recommended size for Background with 1920 × 1000 Pixels and Thumb Image with 278 × 450 Pixels. The recommended size for Thumb Image with 278 × 450 Pixels. No use of Background Image in Fullpage. Recomanded size of logo is 139 X 29 Pixels. 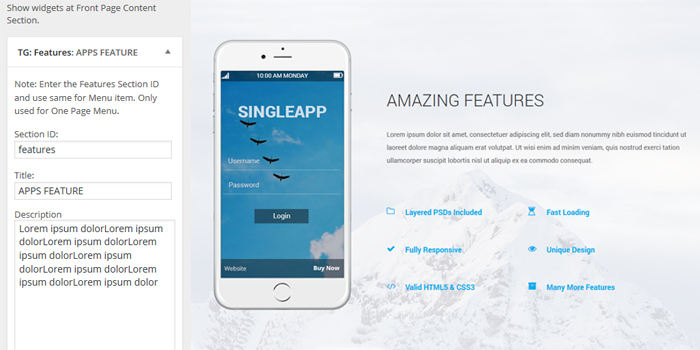 Same header logo is used in both header and footer of Onepage Style in this Theme. 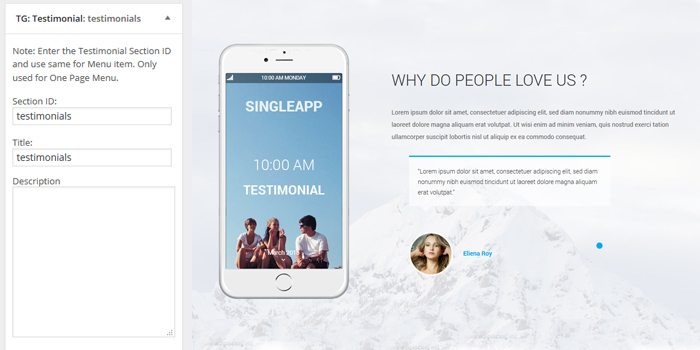 Create 2 pages ie, Home and Blog Page. 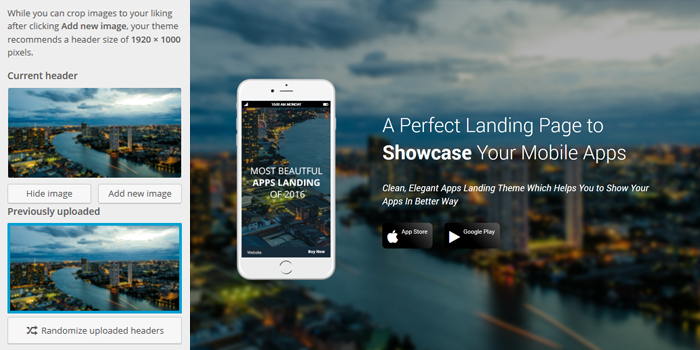 Assign Home to Landing Page Template. There are two types of styles available in this theme. By default the theme is Onepage style. You need to upload background image through Appearance > Customize > Background Image. Used only for Fullpage style and set Background Image size with 1920 × 1000 Pixels. 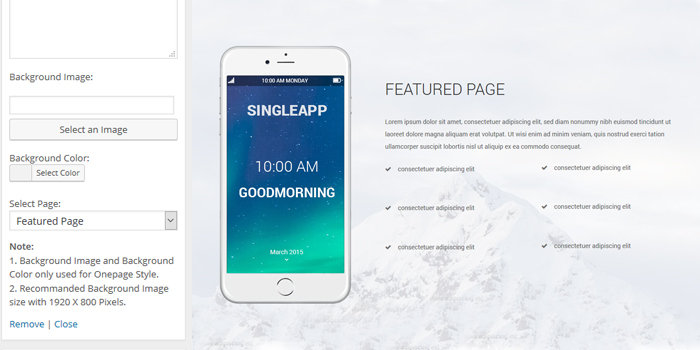 SingleApp provide six awesome widgets that you can use in Front Page Builder Sidebar to make your site look amazingly Beautiful. 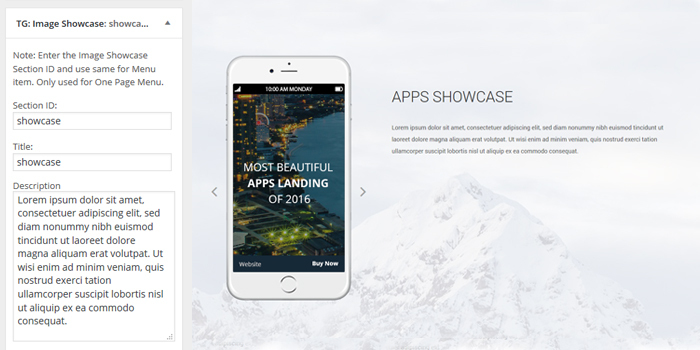 Go to Appearance-> widgets, drag/select the widgets in the Front Page Builder Sidebar to display it on the Front Page Template Page. This widget enable you to display your features. In this widget, enter the Title, Description, Thumb Image and number of pages with font awesom icon class to display. Create pages for each Features, enter the Title, Description and set a Featured Image if you don’t wont to display font awesome icon. Drag the TG: Features Widget in the Front Page Builder Sidebar and enter the Title, Description, Thumb Image and select the page from each dropdown and enter font icon class for related page of dropdown. Select the Image size with 1920 X 800 Pixels or Color to display as Background. Background image (if used) will override the background color and only used in Onepage Style. No use of Background Image and Background Color in Fullpage Style. Info: The Recommended size for Thumb Image size with 278 × 450 Pixels. This widget enable you to display your overviews of single Featured Page. In this widget, select page to display. Drag the TG: Featured Page Widget in the Front Page Builder Sidebar and select page from dropdown to display the full content of page. To achive featured page content design same as demo please add following formate in you page content area. 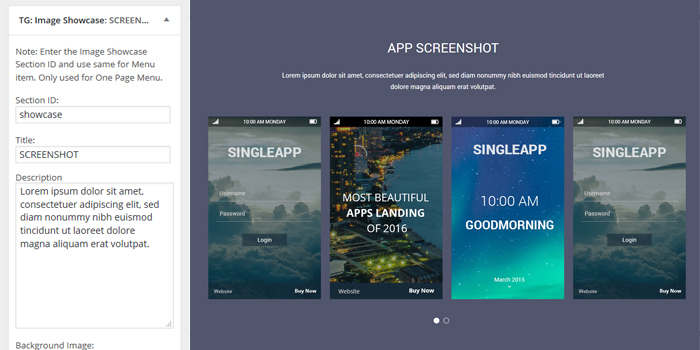 This widget helps you to display Images as Image Showcase, enter the Title, Description and Upload Images to display. Drag the TG: Image Showcase Widget in the Front Page Bulder Sidebar and enter the Title, Description and Upload Image to display. Info: The Recommended size for image is 278 × 450 Pixels. Display Call to action. In this widget, enter the Title, Text, Button text, Button redirect link. There is also the option of background color and image. Set color to display it as backgound or Upload image. Drag the TG: Call To Action Widget in the Front Page Bulder Sidebar and enter the Title, Description, Button text, Button URL and Upload Thumb Image to display. Info: Recommanded Thumb Image size with 850 X 212 Pixels for Onepage and 278 × 450 Pixels for Fullpage style. This widget enable you to display your testimonials. In this widget, enter the Title and select number of pages to display. 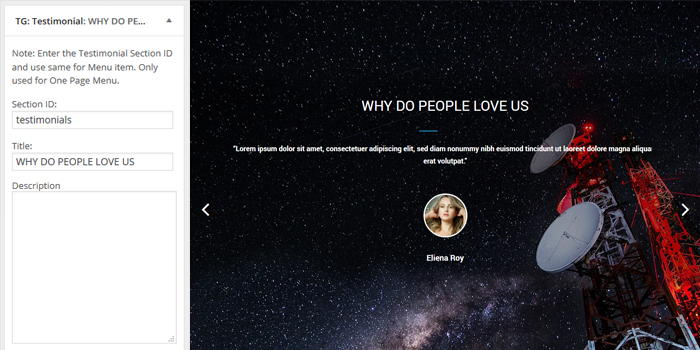 Create pages for each Testimonials, enter the Title, Description, set a Featured Image. Drag the TG: Testimonial Widget in the Front Page Builder Sidebar and enter the Title and select page from each dropdown to display. Background image (if used) will override the background color and only used in Onepage Style. No use of Background Image and Background used Color in Fullpage Style. Info: The Recommended size for Thumb Image is 278 × 450 Pixels only for Fullpage Style. This widget is for displaying your contact information with title, description, soical icons and contact form. 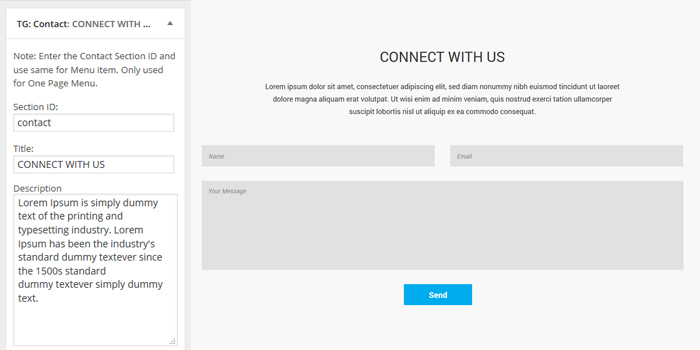 Drag the TG: Contact Widget in the Front Page Builder Sidebar and enter the Title, Description, shortcode of Contact Form 7 and Social Icons to display. 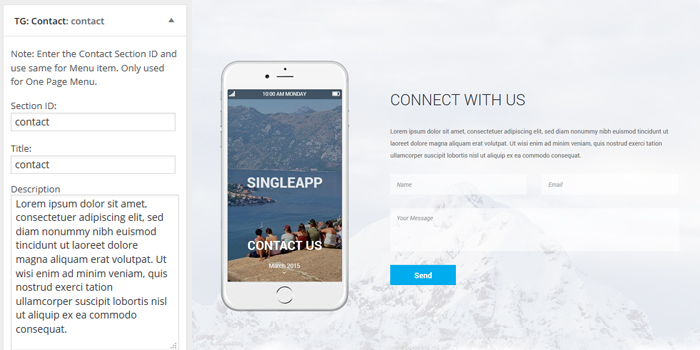 To achive contact form design same as demo please create contact form in following formate. Info: The Recommended size for Thumb Image size with 278 × 450 Pixels. No use of Background Image and Background Color. Info: No use of Background Image and Background Color. Info: The Recommended size for Thumb Image is 278 × 450 Pixels. No use of Background Image and Background used Color. Info: Recommanded Thumb Image size is 278 × 450 Pixels. No use of Background Image and Background Color. Info: The Recommended size for Thumb Image is 278 × 450 Pixels. No use of Background Image and Background Color. Info: The Recommended size for Thumb Image is 278 × 450 Pixels. No use of Background Image and Background. 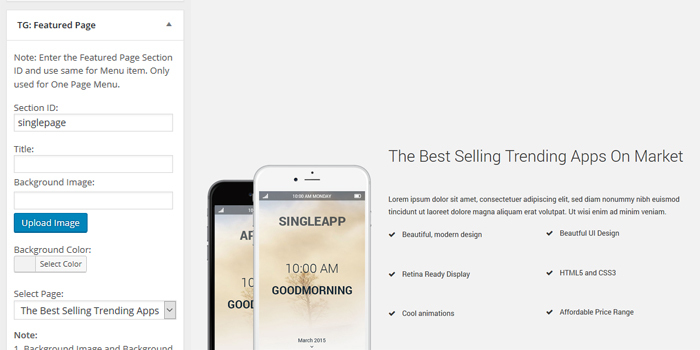 SingleApp have Primary Color Options, which allow you to set the primary color for your site. 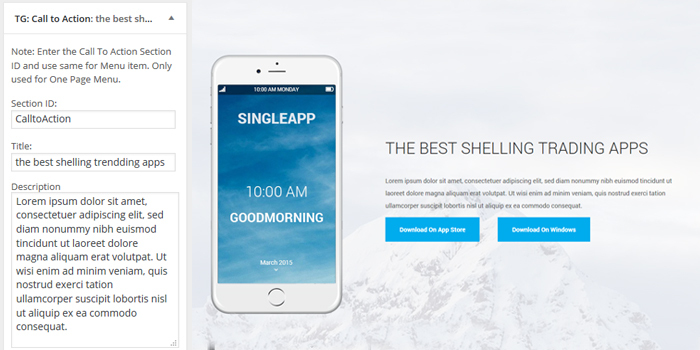 SingleApp have Custom CSS Box which will ease your work if you need to add CSS in your site. Note: It will strip all the tags. Also, we strongly recommend not to edit the code in the theme’s file. All you changes will be lost if you update the theme. Use child theme instead. Hide the animatation effects in the front page content. 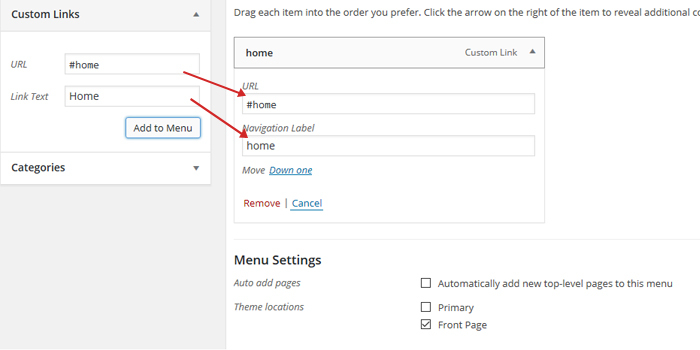 Additional options are available in Appearance-> Customize-> Footer Options-> Footer Social Icons. Install Social Plugin from above given link, generate Shortcode and use Shortcode in given input fild to display the social icons in footer area only for fullpage style. 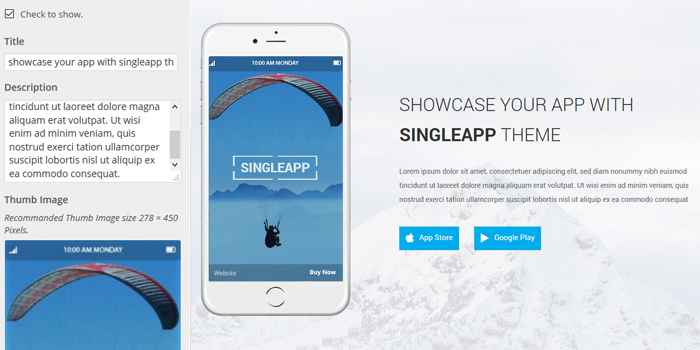 SingleApp provides different hooks to add custom functionalities.